Sahal Gure Mohamed, 62, texts on his mobile phone while waiting in line at dawn to register at Ifo refugee camp in Dadaab, Kenya. Mohamed fled to Dadaab from Beledhawo, Somalia. 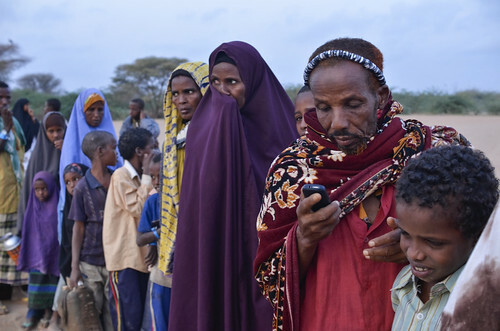 Just over 10 percent of new arrivals and nearly 20 percent of long-term residents surveyed by Internews said they access information through cell phones. Safaricom offers cell phone service throughout the camps.